Welcome to the Riverworld, where everyone who has ever lived is reborn, from primitive cave-dwellers to astronauts . . . all on the banks of a mighty river millions of miles long. At the end of that river lies the ultimate secret of the universe – and the key to human immortality! 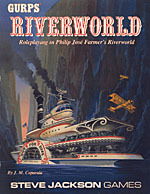 The grand vision of Philip José Farmer's Riverworld series is brought to life in GURPS Riverworld. Your character can be anyone who has ever walked the Earth – play famous historical figures, or even yourself! Meet people from all across history . . . re-create technology . . . form nations . . . build riverboats and airships . . . journey to the Polar Sea and the Dark Tower of the Ethicals! A complete history and overview of the Riverworld, covering the land, technology and inhabitants of the planet, including a complete chronology based on the five Riverworld novels. Rules for creating three types of Riverworld characters – original PCs from any time period, famous historical characters, and Riverworld versions of yourself and your friends. GURPS statistics for major characters of the novels: Sir Richard Francis Burton, Sam Clemens, Alice Hargreaves, the alien Monat, and many others. 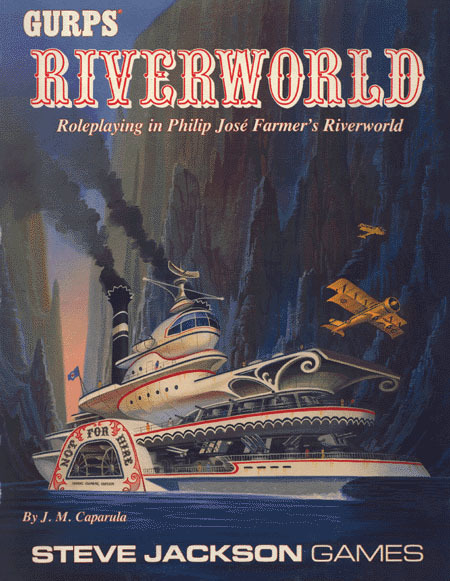 A detailed and comprehensive system for constructing high-tech riverboats, airplanes and airships, and rules for air and river combat. Background information on the Ethicals, the wathans, the Dark Tower and the Computer. Guidelines for running a GURPS Riverworld campaign, including Ethical player characters. "Resurrection Day," an introductory adventure that can be used to start any campaign. The adventure is just beginning – on the wondrous Riverworld! This book is designed for the Generic Universal Roleplaying System; you need only the GURPS Basic Set, Third Edition, to play. It can also be used as a sourcebook for any roleplaying game. GURPS Who's Who 2 – The second volume of 52 real-life characters for historical and time-travel games introduces an even more varied collection of personalities.